Seventy five years ago, sometime in the month of April in the year 1943, it is said that a Waring family home burned in Maryland . . . that home is pictured in the below collage . 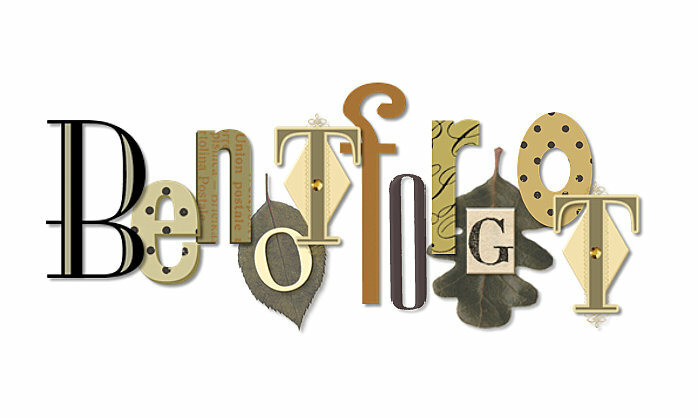 . .
Johnston, Frances Benjamin, photographer. Southampton, Chaptico vic., St. Mary's County, Maryland. 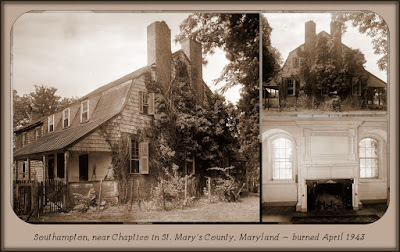 Chaptico Vic Maryland St. Mary's County, 1936. to 1937. Photograph. Retrieved from the Library of Congress, https://www.loc.gov/item/2017887724/. This centuries-old home, which had been known to several generations of the Waring family as Southampton, was located near Chaptico in St. Mary's County, Maryland. According to Maryland, a Guide to the Old Line State (1940) . . .
SOUTHAMPTON . . . ancestral home of the Bond family, now a two-and-one-half-story clapboarded house, with a gambrel roof and porches along the front and rear. The ivy clinging to the huge double brick chimneys -- which have a pent between and pent flanking -- is said to have been brought from Kenilworth Castle shortly after SOUTHAMPTON was built by Richard Bond in the seventeenth century. The wall-of-Troy panel above the fireplace is the only carved wall panel remaining. The old witch door has H hinges, a brass lock, and a pendant handle. The following news clipping from 1867 mentions that the death of my 4th great-grandma occurred at this residence. DIED. 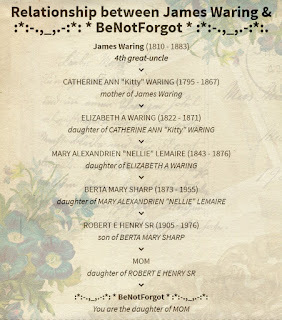 On Friday, the 12th instant, at Southampton, the residence of her son, Dr. James Waring, after a long and painful illness, which she bore with Christian patience and resignation, Mrs. KITTY* WARING, widow of the late EDWARD G. WARING, of Prince Georges county, in the eightieth year of her age. St. Marys Gazette, Leonardtown, Md., Thursday morning, July 25, 1867. 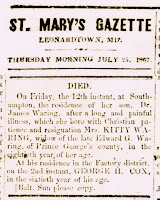 And then in 1883, the following news clipping mentions that Kitty's son, Dr. James Waring, dies at the same residence . . . 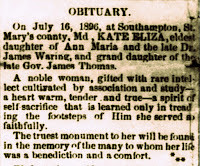 In 1896, Kate Eliza (daughter of Dr. Waring) died at Southampton . . . In 1901, Dr. Waring's widow died, also at Southampton . . .
Then, just two months ago today, the death of another Kitty brings about the mention of Southampton in yet another news clipping . . . The Kitty who died in 2018 was apparently living at Southampton when it burned. She is also the Kitty who gifted the DAR with a Lone Star Quilt which once belonged to our Grandma Kitty. 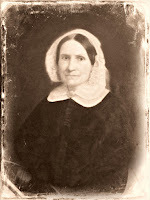 <---*This KITTY WARING is the one who is a 4th great-grandma to the Keeper of this family history blog . . . she is also the Kitty who made the quilt referred to above. The following chart shows the kinship between benotforgot and Dr. James Waring. Note that this chart was generated by Ancestry, and that Ancestry chooses to show him as a 4th great-uncle. 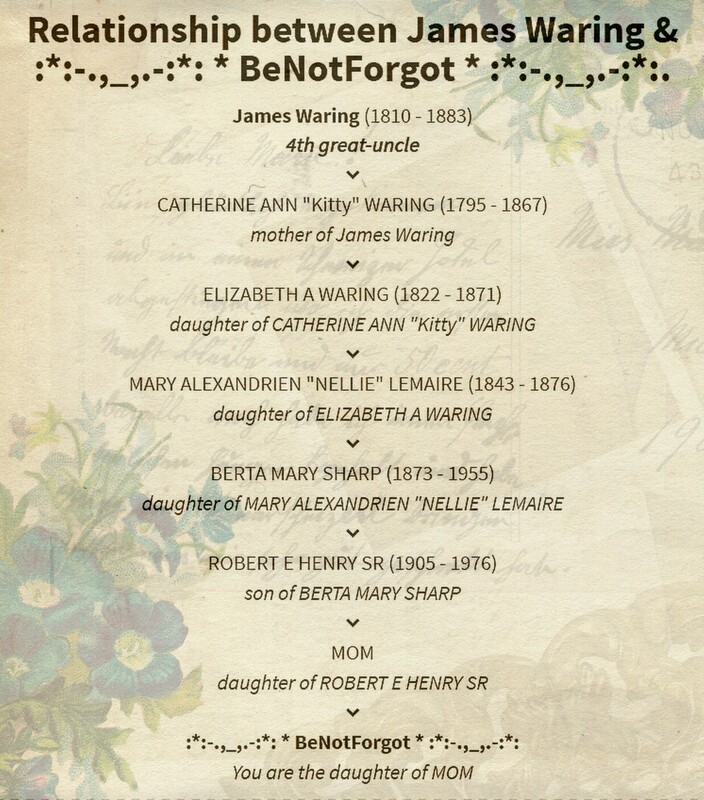 But since this Dr. Waring is the brother of my 3rd great-grandma, it makes much more sense to me to refer to him as my 3rd great-grand-uncle.